Due to the half days and funny schedule this week, 7th graders were only able to spend one class period working on these oil pastel drawings based on Vincent van Gogh's famous Sunflower paintings... and they turned out great! Vincent van Gogh is one of the most influential Post-Impressionist painters, who used bold strokes of color to portray emotion. 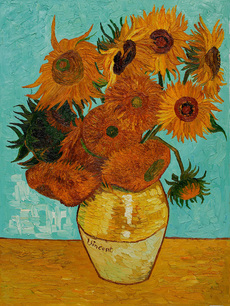 His sunflower series was painted in hopes to impress his friend and fellow artist, Paul Gauguin. For our version, we took inspiration from van Gogh's composition, but used different colors to portray various emotions.